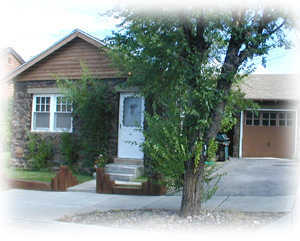 A sparkling cottage which has a southwestern touch. Pat has traveled to the Hopi and Navajo Indian reservations and purchased authentic pieces from the tribe; including sand paintings and rugs. This cottage has a trundle day bed which makes into two twin beds. 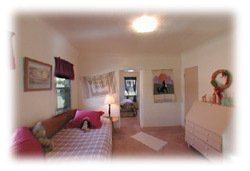 The second bedroom has a queen bed; the fireplace in this room adds to the ambiance of this cottage. The decor throughout is relaxing and comfortable.. The only cottage with a southwestern decor, this is special because it has an open feeling. 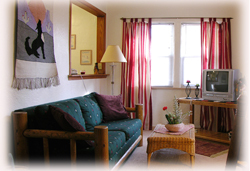 You will be very comfortable here after a full day of hiking or biking. 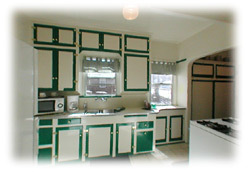 This bright and sparkling kitchen has a breakfast nook for you to enjoy a home cooked breakfast or a bedtime snack. A spacious bedroom done in a Southwestern decor, complete with its own gas fireplace, is just what you need after a busy day visiting the many Indian ruins. 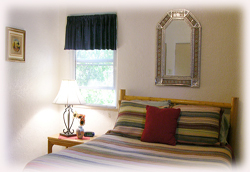 The queen bed is delightfully decorated with a southwest woven comforter & a down comforter. Funtional in design, with a trundle bed which becomes 2 twin beds, this bedroom is decorated with checked blue comforters and complimented with blue curtains. Rug wall hangings complete the room.